When you are creative, you connect with the ceaseless, unfolding movement of the universe. To create means to connect with the expanding galaxy, the swaying ocean, the crashing waves, the swinging trees, and the rolling breeze. It’s connecting with Nature, with the soul, with everything! The power that fuels your creativity is the precisely the same power that fuels Nature! Creativity is the life giving force that keeps all of Nature moving, shifting, and growing in abundance. When you deepen your relationship with your own unique creativity, you deepen your relationship with Life. In fact, if you take the free introductory Creation Meditation online course, you’ll learn that just like a Eucalyptus tree has its own unique expression and just as a whale has its own unique expression in Nature, you too have your own unique expression. When you are creative, when you deepen your intimacy with Creation – as it emerges through you – you deepen your experience of authenticity. You uncover who you are, on the absolute level, as well as on a relative level. You discover the messages, wisdom, and information that only you are meant to share. 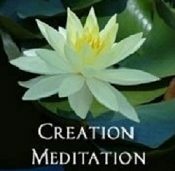 Creation Meditation is a spiritual practice that combines meditation and mindful creativity. It is meant to open you, deepen you, and connect you to your own life energy. It is meant to reunite you with your essence. It’s completely free. And you can begin right now. This course is designed to guide you in using writing as the primary tool to connect with your inner experience, to access your inner wisdom, and most importantly, to connect with the river of Creation. The course provides specific steps and supportive suggestions to begin and deepen a writing practice. It includes instructions for meditation, how to use the Socratic method in your inner exploration, and how to get the answers you’re looking for. In this course, you will learn how to empty yourself of yourself, how to become a conduit for Creativity, and how to access the wisdom you need from within. If you were to begin and commit to this practice, it can lead to an ever-deepening, alchemical transformation. Email and, if needed, phone support is provided throughout the duration of the course. Course participants should plan on spending at least 2 hours each week reading the discourse and completing the exercises. To begin, register for Deep Writing by clicking on the button below. Woven into this course is the wisdom of Michele Cassou and Aviva Gold. This course guides you into the deep practice of Creation Meditation using painting as the primary experience. It is designed to guide you in using painting as the tool to connect with your inner experience, to access your inner images, and most importantly, to connect with the wisdom and intelligence of Creation. The course provides specific steps and supportive suggestions to begin and deepen a painting practice and places an emphasis on using your inner images for transformation. It includes instructions for meditation, how to use the imagination for inner exploration, and how to get the deep answers you’re looking for. In this course, you will learn how to empty yourself of yourself, how to become a conduit for Creativity, and how to access the wisdom you need from within. If you were to begin and commit to this practice, it can lead to an ever-deepening, alchemical transformation. Email and, if needed, phone support is provided throughout the duration of the course. Course participants should plan on spending at least 2 hours each week reading the discourse and completing the exercises. To begin, register for Painting as Meditation by clicking on the button below. Often we feel blocked creatively. We want to paint more, dance more, express more. We want to feel ourselves more, be more authentic, and have the freedom to be ourselves with everyone. Yet, the riverbank upon which creativity flows is you! When you clear away the stones, the debris, the old thoughts and patterns that block the flow of your creativity, the fuller and more radiant your creative flow (and your authentic self) will be. Course participants should plan on spending at least 2 hours each week reading the discourse and completing the exercises. To begin, register for Igniting the Fire of Your Creativity by clicking on the button below. Around 16 billion years ago, something happened. A birth of light and energy, the start of something miraculous occurred – the universe was born! Over thousands and thousands of years, that energy, that creative explosion, continued to grow and expand and it created more and more of itself. Planets, moons, stars, galaxies, comets, suns, and dark matter came into being. The creative impulse that gave birth to the universe continues to create life right now in this moment. The breath, waves, clouds, thoughts, images, bodily sensations, ideas, visions, moods, and a host of other forms of phenomena are coming into and out of existence right here and now. So, what does this creative energy have to do with you? Well, you are a part of that expanding process that started 16 billion years ago – AND your role in that unfolding has something to do with helping the universe expand even more, helping the cosmos grow even more. By becoming creative, by opening yourself to the creative flow, you reconnect with the power of the Tao and discover how the universe is expanding and wants to expand through you! The intent behind this course is to get you in touch with the creative life energy of the cosmos. More specifically, it is designed to connect you with the unique way the creative force is flowing through you. It was crafted to get your creative juices flowing and open a channel within you to allow the fullness of YOU to shine through. This is an advanced course requiring a regular practice of meditation and creativity. Each week for seven weeks, you will receive an email with information on that week’s lesson as well as a list of exercises. Course participants should plan on spending at least 2 hours per week reading the discourse and completing the exercises. To begin, register for The Tao of YOU course by clicking on the button below.